This Combo Cleaner review gives informative insights into the app’s Mac optimization and antivirus features while singling out its main pros and cons. Clutter-free and ever-secure Mac is wishful thinking rather than the objective reality. In fact, tons of duplicates, application leftovers, long-forgotten large files and browser cache can take up gigabytes of drive space and prevent the computer from performing at its peak. Plus, Mac malware is on the rise, scouring the Internet for new victims. The Combo Cleaner utility by Lithuania-based RCS LT company purports to keep all of these problems at bay. It goes equipped with a disk cleanup feature, big files and duplicates finder, app uninstaller, antivirus, and privacy scanner. Such a fusion of services fine-tuned for Mac is definitely welcome these days. However, there are quite a few other solutions that make similar, if not identical, claims but hardly meet the challenge. Does Combo Cleaner actually do what it says? I’m going to put it through extensive testing to answer that question. So here we go. Is Combo Cleaner safe and legitimate? Of course, it is. It easily detects Mac viruses thrown at it, moreover, it was certified by OPSWAT Labs in the anti-malware category. Combo Cleaner supports OS X 10.10 (Yosemite) and later versions of the macOS platform (El Capitan, Sierra, High Sierra, and Mojave). Its stub installer can be downloaded from the vendor’s official site as well as the Mac App Store. It is a DMG file sized 4.9 MB that’s specifically tailored to make the setup process smooth and intuitive. Before I proceed, let’s get one important aspect straight. Some users have a misconception that Combo Cleaner is freeware. In fact, it does go equipped with a few free features, such as the Disk Cleaner, Big Files Finder, and Duplicates Scanner. However, if you’d like to benefit from the app’s Antivirus, Privacy Scanner, and Uninstaller modules, you’ll have to upgrade to premium. In other words, it won’t charge you for scanning your Mac for all kinds of viruses, malware and privacy issues, but the removal functionality will only become available on a paid subscription basis. When it comes to the licensing, things are quite clear-cut. There are two plans: single user for 1 Mac ($39.95 for 6 months) and office / family for up to 5 Macs ($69.95 for semi-annual subscription). This isn’t the cheapest offer across the board, but the deal should be worth it as long as the application does a good job protecting and optimizing your Mac. The installation routine is nothing out of the ordinary: you launch the setup assistant and click through a few garden-variety dialogs to get Combo Cleaner up and running. From where I stand, the app’s GUI makes a great first impression. It’s user-friendly and sleek, with every icon saying precisely what it does. The design and color scheme are undoubtedly on the plus side of the program. From the get-go, Combo Cleaner performs an assessment of your Mac’s health and welcomes you with the dashboard whose upper section reflects the amount of available disk space, free memory, and current CPU load. Down below are the scan results for each one of the above-mentioned areas covered by the software. This pane is a one-stop system status information that includes both the security and performance essentials. The solution runs fairly fast and has a moderate system footprint. The first full scan took less than 30 minutes to complete, and the app only added an extra couple of seconds to Mac startup time. Of course, the scan duration is a variable that depends on the size of your disk, but it won’t exceed any reasonable benchmarks whatsoever. The feature set of this program aligns with the best practices of delivering Mac maintenance and security services. It should meet the average user’s expectations without encumbering the experience with anything redundant. Here’s the lowdown on the main features of Combo Cleaner. Disk Cleaner is exactly what it sounds like. It evaluates the contents of your hard disk and advises on the amount of memory that’s safe to remove. This module spots and obliterates unnecessary application caches, downloads, app logs, and allow for emptying the Trash folder in one click. This functionality is entirely free to use. Big Files Finder is pretty self-explanatory, too. It checks your local and external storage media for items that take up much disk space and may no longer belong on your Mac. The default preset looks for files larger than 100 MB, but you can easily customize this parameter by indicating a smaller value. It’s also quite handy that Combo Cleaner breaks down the detected objects by the following size criteria: up to 1 GB, 1 GB to 5 GB, and more than 5 GB. Furthermore, you can easily sort these likely-unneeded entities by date. Importantly, this feature doesn’t require any payment to use either. Duplicate Files Finder is yet another feature falling into the disk cleanup category whose logic comes down to spotting identical copies or similar matches of the same file. This is particularly relevant for photos, audio files and videos – the types of data people often download repeatedly. The obvious action to take in regard to these items is removal, which is what the app can do in the blink of an eye. Moreover, the software won’t charge you a penny for this. Antivirus is one of the fundamental components of Combo Cleaner. In fact, lots of users actually install this application to remove malicious code from their Macs in the first place. In case you still think Mac malware is a myth, just look up “Download Valley” on search engines. It is a huge syndicate coining adware that targets macOS alongside other platforms. The Genieo and Weknow.ac infections are some of the most notorious examples plaguing Apple computers for years. Back to the point, this particular feature is definitely praiseworthy as it identifies Mac adware (including browser hijackers, popup viruses and ad-injecting threats) and other types of malware with an excellent detection rate. The virus database is updated on an hourly basis to ensure protection against new and emerging menaces. Keep in mind, though, that you need to purchase the product’s license to unlock the virus removal functionality. Meanwhile, the scan is free. Another interesting hallmark is that although the module is tailored for Mac, it can also find Windows malware and therefore keeps you from accidentally or unknowingly sending any pests to other people who use PCs. That’s something I haven’t seen in any competing security solutions. Privacy Scanner is one more feature that’s a prerogative of premium subscription only. It focuses on analyzing the installed web browsers and email clients for “breadcrumbs” that may disclose your personal data and thus pose risk to your identity. These verbose objects include cookies, browsing and search history logs, cache, saved forms, bookmarks, as well as potentially unwanted browser extensions. At the end of the day, not only does this module take care of sneaky threats to your online privacy, but it also boosts browser performance by removing the above-mentioned junk. At first sight, it may appear that the Uninstaller feature does the same as the Mac native app removal mechanism. However, it’s got a game-changing advantage over the latter. Here’s the thing – even after you remove a program from Mac the regular way, its leftovers may persevere in the system and take up disk space. Also, there are stubborn apps that simply prevent you from removing them. Combo Cleaner can locate obfuscated fragments of previously uninstalled software and force-remove apps that exhibit adverse persistence. Plus it provides an all-in-one list of your installed applications with a quick preview option. The only caveat is that you cannot use this functionality unless you are premium user. Tech support is probably the weakest link in the whole user experience chain delivered by Combo Cleaner. While the vendor does provide a way for customers to get assistance, the choice is pretty much restricted to submitting a ticket, period. There is no live chat with company reps, nor is there a phone number to dial. What’s more, I couldn’t find any product knowledgebase or FAQs on the publisher’s website. The only offset for this scarceness of support channels is that the app actually runs smooth, detects and removes Mac malware, finds and wipes unnecessary files, and generally copes with the cleanup task immaculately. At least, I didn’t run into a single issue during the test. Furthermore, the support agents claim to be available 24/7 and respond to tickets quite fast. One way or another, I hope the vendor will expand the range of their support services in the near future. 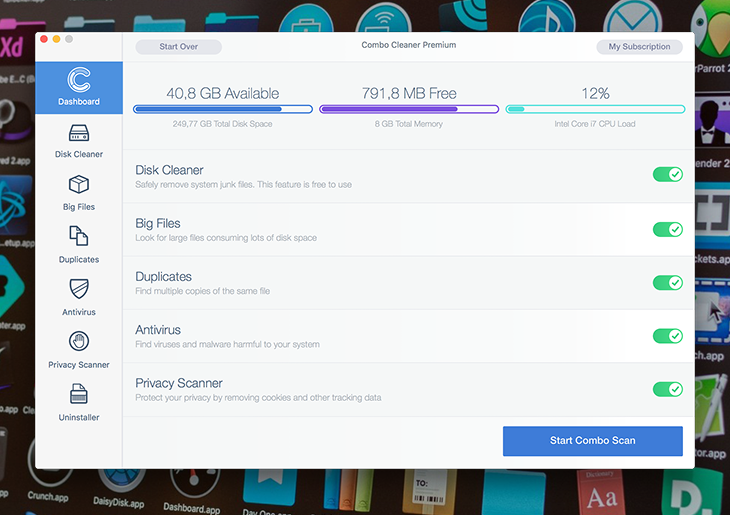 Combo Cleaner combines Mac maintenance and security features under the same hood. Whilst this is a common practice for quite a few software publishers out there, the efficiency of these modules is what really matters. Speaking of which, the app in question can take care of nearly any Mac malware issue – be it a browser redirect or popup ads virus, a rogue system optimizer, spyware, or ransomware. It also has enough optimization power to speed up your machine considerably. The biggest quirk that makes me frown is the support section on the product’s website, which boils down to filling out a form. This is the tradeoff that will hopefully vanish sometime soon. Overall, Combo Cleaner is a worthwhile application. It does all the tedious work for you to make your Mac experience hassle-free and secure.